This one's just a general catch-up episode but good news! I've stopped whining about bag-making! Hey, strangers! I know, I know. It's been awhile. Time just got away from me these last few weeks. But this episode plays catch up! Finally! In this episode, I give a little bit of a Sandy update and then spend the rest of the episode talking back to you! I highlight some of the 5th Podcastaversary comments and catch up on the last few weeks of blog comments. I love it when you talk to me--keep 'em coming! In this episode, I talk about my work road trip and why I didn't have a whole-lotta quilty goin' on, but how I'm setting myself up for more success (and less stress) in the future. There's also the first half of a backlog of listener feedback! For more information on David Allen's GTD system, you can also visit his website at gettingthingsdone.com. An interesting, but very fast/surface "energy profile" based on Loehr and Schwartz' work can be found at www.performanceprograms.com. However, you need to be familiar with their work to understand what the categories mean. I really do highly recommend their book! In this episode I announce the lucky winners of my 5th Podcastaversary Giveaway--woo! Thanks, everyone--it was a lot of fun! Then I talk about what I've been up to as I've been wandering hither and yon about the country for the last couple of weeks, and I let you in on big news in my personal life (it's announced at the beginning but I don't talk about it at any length until the very end so you can choose whether or not to listen in at that stage). In this episode, I'm still trying to figure out the new microphone. (Sorry! It's a little more "live" than my old one!) I talk about getting rid of some stash, adventures with embroidery, frustrations with even just prepping for some upcoming projects, and having lots of fun in the basement. This is not an episode, it is only a test. Please give it a listen and comment here about the results! In this episode I talk about exhaustion and embroidery, some improvements in my free motion quilting, hunting and gathering, and yesterday's art quilt design class (take 2). I also do some listener feedback. Did I fix the sound issues? I'm using a new recording software with a HUGE learning curve. I think I figured out the basics so hopefully the sound will be fine this time around. However, I apologize for the large file size for those of you who are downloading. I haven't yet figured out how to reduce that in this new software. Baby steps. In this episode, I talk about my happy dances on a benchmark reached in one of my current textile projects, plus a teaser for my upcoming giveaway. And did you know it's National Crafting Month? Get ready for National Quilting Day on March 21! I also talk about the class on Colors and Curves I took yesterday and two books she recommended. Plus, I finally do a couple of week's worth of listener feedback. In this episode I feel like I got a bit rambly, but I think it's okay because I still gave a lot of information about tools, notions, apps, and books that I've recently gotten my hands on. Plus a Sandy update about what I'm currently working on. Listener Feedback will happen next week, so get those comments in! Can you hear me now? Can you hear me now? In this (hopefully louder) episode, I talk about pushing myself to do something I don't like doing very much (and still not particularly liking it), then treating myself to something that really gives me a buzz. And then I talk about some other stuff too. Mostly, I've had a pretty productive weekend--yay! Yep--I share some of what y'all decided you're going to do in 2015! But first, I talk about the Art Quilt Design class I took yesterday and all the immense fun I had with it, plus the fact that it sent me down into my Mad Quilt Scientist studio this morning to dye me up some more fabric to play with. It's snowing! And that means pretty, pretty colors spring to life in my basement. In this episode, I announce the winners of the 2015 Quilty Resolutions Giveaway and a throw-down-the-gauntlet challenge between me and Sandi of Quilt Cabana Corner podcast and blog involving snow-dyes. I also talk about the possible chance of a meet-up in Kansas in June. 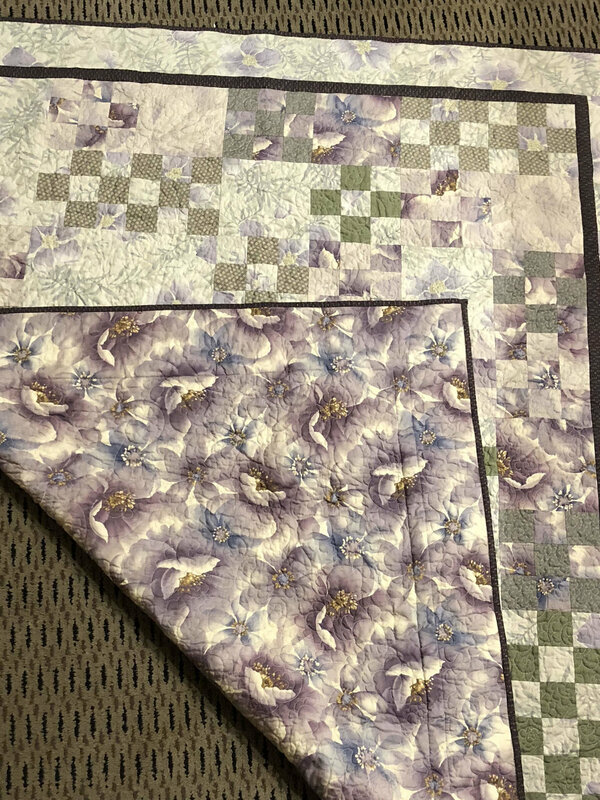 I give an update of my current quilty projects, talk a little bit about reading plans for 2015, and do some listener feedback. Daisy of Very Lazy Daisy Quilts podcast and blog lifted these up to my notice, although they've also been talked about by Tanesha of Crafty Garden Mom podcast and blog as well. And, finally, the monthly short story magazine subscription I mentioned is One Story, at www.one-story.com. I'm back in the land of the living...mostly...and talk about some projects I've been poking away at over the last couple of weeks when I wasn't busy coughing, sneezing, or laying in a darkened bedroom with warm compresses on my eyes. I forgot to go back and tell you the name of the audiobook I reference in this episode: it's A Demon Summer by G.M. Malliet, a cozy British mystery read by a great narrator. (Malliet is American but went to school at Oxford and lived in the UK for a period of time.) I'm enjoying it, although only about halfway through so check in with me later when I've finished it. The Missouri Star Quilt Company zipper pouch tutorial, in case you're interested, is at the bottom of this page underneath the podcast. I'm skipping the "travelogue" portion of report on my trip to Burma/Myanmar for now (and explain that a little bit in this episode). Meanwhile, back to our regularly scheduled programming--it's time for 2015 Quilty Resolutions! In this episode I give a Sandy Update about what I'm currently working on, as well as a summary of how I did on my own 2014 quilty resolutions. Then I announce the 2015 Quilty Resolution Challenge! 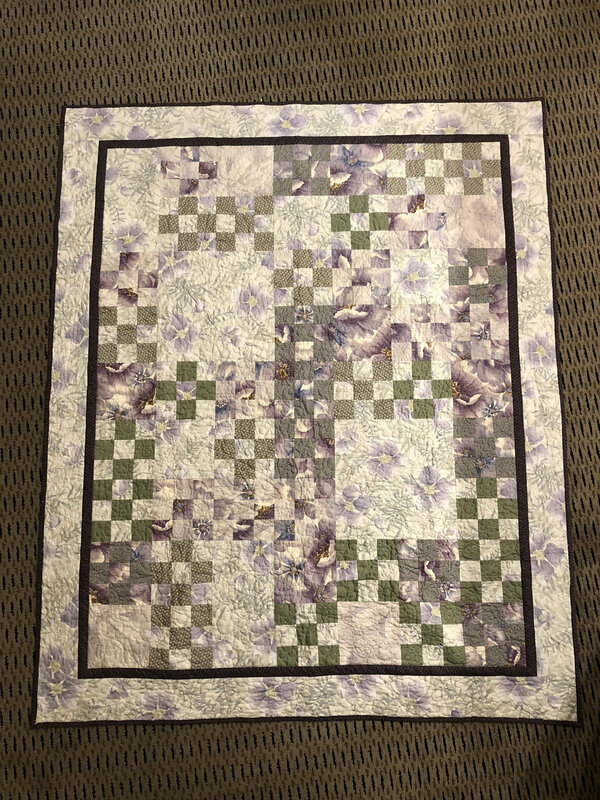 I'll have a submission form and Rafflecopter up on my blog sometime before the end of this week so you can enter my 2015 Quilty Resolution Challenge Giveaway. Have fun thinking of what you want to do! This episode is for textile lovers--quilters, weavers, spinners, and fiber artists. In this episode, I talk about all the wonderful textiles I met while in Burma/Myanmar in December. You'll hear about silk, cotton, and lotus spinning and weaving, and my adventures with a talented seamstress/tailor. Pictures will be on my blog sometime next week. No take-backs! I promise--this one will stay. I'm done messing with your minds for awhile. In this episode, I talk about machine quilting words and doing some hand embroidery. Plus the usual listener feedback. This may or may not be the last episode I'm able to post before skipping the country. If I don't manage one next week, I'll catch ya on the rebound! I posted the original episode 168 on Sunday afternoon, then pulled it back off again on Monday morning as I woke up thinking, "Sheesh--I could have done better." So this is the remix version. In this episode I give a couple of announcements about upcoming happenings in the social networking world of quilters, as well as a Sandy Update including how a Craftsy class helped me figure out a quilt design and how purple dye is back in my life again, and the highlight: My experience of Jenny Doan doing a trunk show. In a nutshell: Fantastic! Plus a podcast suggestion and listener feedback. So much fun in an hour! In this episode, I talk about what I learned from my latest Craftsy class and was able to immediately put to use on my current project; I also review two books (see below for links).